I have a left-brained kiddo. In fact, I have two. Two kids who see the world in black-and-white, logical terms. Two kids who approach everything with reason and objectivity. In stark contrast, I have two right-brained kids. Two kids who see the world in color and movement. Two kids who filter all of life through emotion and passion. In a home where simple logistics requires much of our learning to be combined, it is often tricky to provide educational activities that incorporate BOTH right and left-brained styles of learning. *Disclaimer: I was given a free Art in History kit for my honest and thorough review. In addition, I also received monetary compensation for my time. All opinions expressed are my own. Your experiences may vary. While one of my older children likes the left-brained-ness of history, the other one prefers the right-brained-ness of art. The simple and logical solution...(Did I mention I am a left-brained thinker too?) is to smoosh the two together! History (concrete and factual) and art (creative and imaginative). Art and history. 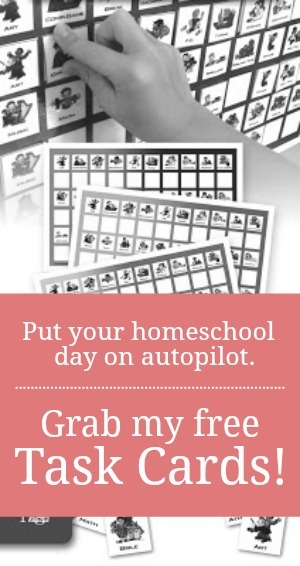 These FANTASTIC all-in-one craft kits are every harried, homeschool momma's dream! While I'd love to ALWAYS provide hands-on, made-to-order learning, sometimes even my jammed-packed Pinterest boards can't fill in the gaps between the WISH to make history come alive and the REALITY of my limited time, resources, and energy. But the truth is, I don't always have to "invent the wheel." I don't always have to create a project from scratch. In fact, after finding Art in History and their all-in-a-box, historically-accurate educational projects, I don't ever have to create another homespun history art project again if I don't want to. 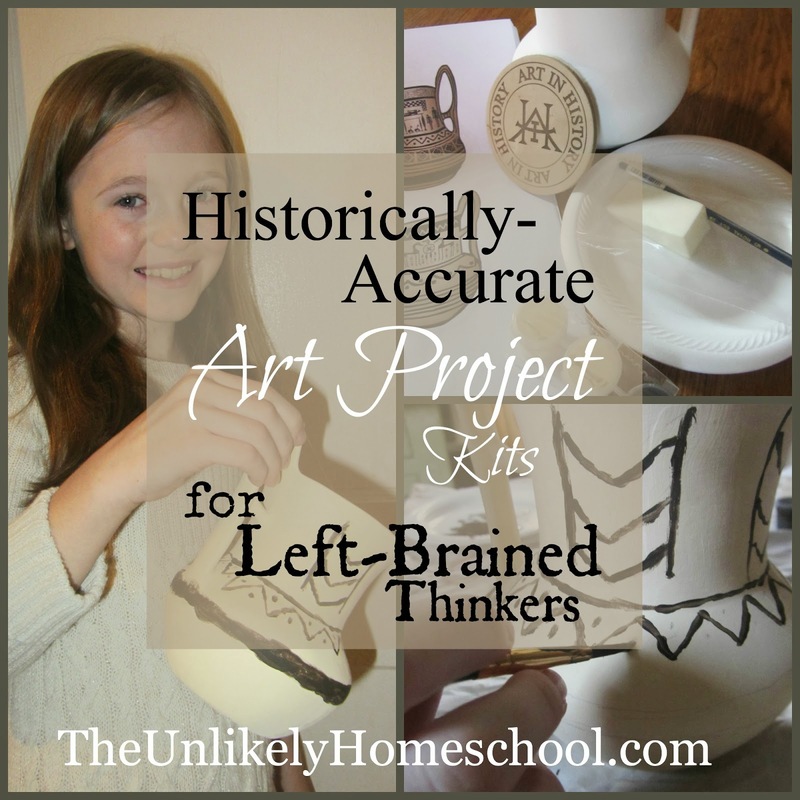 ALL my kids can have discovery (left-brained) through creativity (right-brained) by completing any of the kits included in both the World History and US History line of craft projects. Art in History projects provide "jazz hands" to an average history lesson. The other day, while reading In Search of Troy during our ancient Greece unit, my kids and I came upon some simple illustrations of the urns and drinking vessels created by Grecian and Trojan artisans. While seeing a picture of an artifact in one thing, getting an opportunity to recreate one of your own is another! 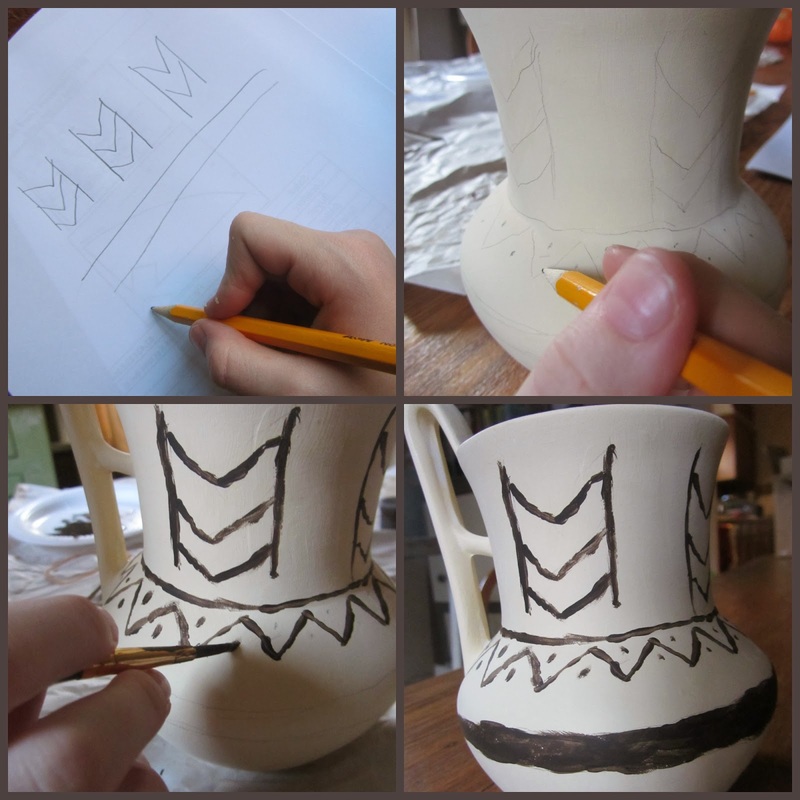 I don't think my kids will ever forget the style of painting and intricate craftsmanship of these ancient pots after having to imitate them in order to complete the Ancient Greece Drinking Vessel (900-700 BC) project kit. Art in History projects are BOTH gentle AND expressive. My daughter, one of my left-brained thinkers, enjoys the THOUGHT of doing art but sometimes doesn't enjoy actually DOING it. It is easy for her to become frustrated when her "plan" doesn't transfer to the canvas (or paper, or sculpture, etc) as well as she had hoped. In other words, art doesn't come naturally to her. She much prefers its more concrete cousin, craft projects that have set directions and a prescriptive outcome. My oldest son, on the other hand, loves art and has a natural bent towards creative expression. Completing an Art in History project is a great way for my daughter to be gently guided towards a completed piece with the help of a thorough lesson-guide, while my son can be given some basic direction and then set free to create! They are a nice blend of product-oriented crafts and process-orients fine art. With limited time to cover all the areas of history that I would like to cover, I don't have time to waste on cut-and-paste history projects that only provide a 2-dimensional view of a 3-demsional subject. If I feel compelled to invest not only time, but also money into exploring a past era with a hands-on project, I want it to be one that is not only historically accurate but also one that offers a quality experience. From what I have seen in their growing product line, each of the Art in History kits provide culturally and historically accurate hands-on-learning. Art in History projects are all-inclusive. Although we have a sizable amount of art and craft supplies tucked away in nearly every room of our home, often I or my kids have to search in multiple locations to gather all the needed materials. Even after searching high and low, it is not uncommon for me to have to rush to the store for a missing or sparse supply OR reschedule the entire activity until the next time I happen to be at the craft supply store. Art in History kits come complete. I can rest in the fact that a planned activity CAN and WILL happen on the arranged day because everything, including tools, are included inside the kits. Each Art in History craft kits retails for $9.95 plus shipping. The lessons and kits are designed for 3rd-12th grade students. The craft paints can be purchased separately and are child-safe, have no odor, are non-toxic, and conform to ASTM D-4236 safety standards. All acrylic paints are conveniently packaged in 2 oz. bottles and can be used on bisque, wood, metal, plastic, and other general craft projects. Want to learn more about Art in History? For more information about these unique history kits, be sure to visit Art in History on Facebook, Twitter, Pinterest, or YouTube. What an awesome giveaway! Thank you for the opportunity! I would like to win the Italian Renaissance Apothocary jar. We are getting ready to start Renaissance history, and that would be just perfect to go along. Neat! The drinking vessel looks cool. So ... choosing is so hard! I would choose the Limoges boxes (since we will soon be studying the French Revolution!) but I bet my kids would choose the Canopic jars (even though we did Ancient History last year!) These are some great looking kits! Awesome!!! Thank you for a chance to win!!! This looks so awesome! I would love the French Revolution - Limoges Style Tabatiere (1769-1324). We just went over the French Revolution and my daughte just could not click with it. She is a very artsy hands on person and I couldn't think of anything that might help her remember it in terms of art projects. This would be perfect to redo the lesson near the end of the year with. The ancient rome oil lamp looks cool! Would love to win the Civil War Face Jug as we approach that era in our US history studies. I like the 15th Century Spain/New World Columbus Basin! That's what we're studying right now. I also really like the American Revolution Colonial Teapot too! Hard choice! This looks like an amazing site that we will definitely put in our "favorites" list! Really like the idea of winning one of the World Art Kits. My kids would love the American Revolution colonial teapot. It is beautiful. All of my children are very artsy and love hands on projects like these. Anything roman or greek, love the greek vessel u tried! I didn't even know these existed!! What a great giveaway. I think we'd start with the English colonial plate. Whoa! I'd never heard of this, so I'm totally excited! My kids are 13-7 and I'd do the colonial teapot!! So exciting to find this neat resource!!! These kits look amazing! Your blog is so incredibly helpful! We would love to win the colonial teapot...Thanks so much! Jill B. The Native American Cultures - Acoma Pueblo Water Jar looks like SO MUCH FUN. I think one of the world history kits would be perfect. Especially from Roman or Greek era. The Mayan Empire cooking pot looks neat! They are all so cool. This is fantastic! Thank you so much for sharing. The American Revolution tea pot would be perfect. We could use it for our studies in American History and reuse for our Tuesday poetry tea time. I would love any if the world history kits! I love history, however my honeschoolers not so much. I think this would really bring them in to it more & give them something fun to do. I love the painting of the water vessel...my son would benefit from this like I did. If it was hands on I would remember it better. I would love to do the Egypt projects. We're having a slow and wonderful start to history through Story of the World. Would love to spend an extra week or two on Egyptian art. I have two very creative kids and we are studying US History, so I will go with the US History one. This is an excellent way to combine history and art at a reasonable price. My kiddos would like to try the water vessel from Greece. My kiddos LOVE history and art... what a neat way to blend the two. The Italian Renaissance Apothecary Jar looks really fun. I'd love the Romanov-Russia Faberge style egg project for my family! What an awesome website! This is my first time hearing about this company. I would choose the Ancient Egypt Ramses II Canopic Jars to use in conjunction with our ancient history studies as seen here https://www.artinhistory.com/art-project/184/World-History-Projects/Ancient-Egypt-Ramses-II-Canopic-Jars-1279-1213-BC. Thank you for the chance to win such a neat art history project. My daughter would love this. 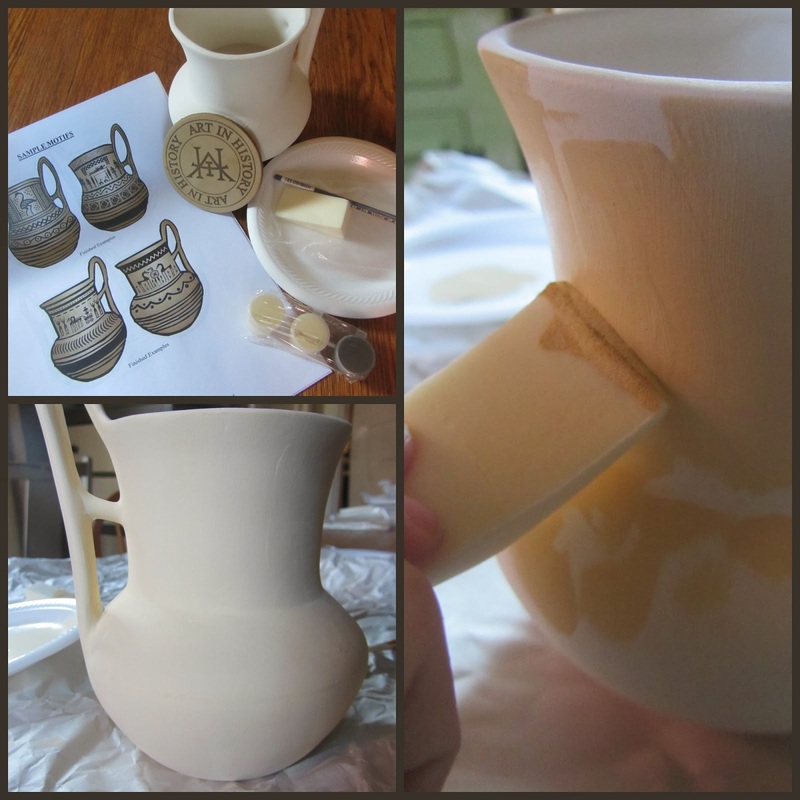 The American Revolution Colonial Teapot project looks interesting and fun. Next school year we are going to study U.S. history and I would like to add this project to our studies. I think the U.S. history projects for the Columbus Basin & the Colonial Tea Pot would be so cool for my 8 almost 9 yr. daughter to do when we start our U.S. history studies! This is such a great idea to combine art & history! Thanks for the review & the chance to win! This is so cool, thanks for the raffle. My daughter would love the Japanese Ceremonial Tea Bowl. This looks cool. My oldest is studying US History, so the US History box would be wonderful for us. Wow! What a great company! We are studying US History so I would be interested in those projects. The teapot looks like so much fun! Is it bad that I'd like to do the projects myself and might be tempted not to share with the kids? ;) I think the chocolate pot is something we could all enjoy together. These art projects would be great for our hands on learner! Wow! What a need idea. I think we would love any of the World History projects.. Our favorite school subject around here.. Would love something from the Middle ages.. But we love Ancient Egypt and Ancient Greek studies too. All of it is so amazing! We are currently studying ancient Egypt, so the Ramses jars would be a wonderful project for my son. I love these. My daughter loves history and loves art, so this is right up our alley. We'd love to win the Colonial tea pot. What a great resource! We would love the Incan Empire - Clay Figurine. I'm going to have to choose a couple of projects for our current studies! I've never heard of this before. What a great resource for our kids. Thanks for sharing. I know my kids would love so many of these projects. Id pick the Caddo Friendship bowl first. My daughter would love projects like this! We would LOVE to win. We are studying American History this year. these look like so much fun! We would choose the Renaissance Apothecary jar or the Columbus basin. Both fit with this years history. I would like to add the Texas Revolution - Alamo Chocolate Pot to our American History Studies. My son loves projects. forgot to add which one I would like, Texas Revolution! I would choose the American Revolution - Colonial Teapot to fit with this year's history study. Such a tough choice. I love all the world history projects, but we will be spending a lot of time this winter on colonial times. So I have to say the Colonial Teapot. We're headed to the Renaissance next, so I'd have to go for the Italian Renaissance project! World History for me. Awesome product.